Choosing a well-fitting dog collar depends on a few factors, including how much fur is removed when your dog is groomed. When you are getting a new dog or simply want to buy a new collar for your furry friend, you need to know what to look for. Most people focus on the type of collar or the color, but one of the most important considerations is choosing the right size. Your dog should always have a collar for identification purposes, and they are also incredibly useful when going for walks. The difficulty arises, however, in selecting the right size. If it is too large it may fall off; but if it is too small, it can become painful. Here are the most important steps to choosing the right size dog collar for your pooch. The first step in finding the right size dog collar is to consider your pup’s breed. You will notice that some collars will have labels recommending them for certain breeds, and this is simply because of variations in size. Keep in mind that selecting a collar based on breed is not enough because every dog is different. However, you can use these collars as a guideline to figure out the right range of sizes that your pet will fall within. If you can’t simply go based on breed information, how do you figure out the best-fitting collar for your pooch? The simple answer is to measure it. You will want to use a cloth measuring tape to figure out the circumference of their neck. Generally speaking, to get the collar size from this measurement, add 1 inch for small breeds (that weigh less than 10 pounds), 2 inches for medium-sized dogs and 3 inches for large breeds (that weigh over 80 pounds). These additional inches ensure that the collar will not be too tight on your pet, which can cause pain or injury. Simply measuring your dog’s neck is not enough to get a collar with a proper fit; you also need to take fur length into account. If your dog has long hair and gets regular haircuts, you should measure the dog right after grooming. Then compare this measurement to one you take right before the dog got groomed (remembering to add the extra 1-3 inches). When you are looking for collars, you want to find one that is adjustable and fits both of these measurements so your dog can be comfortable no matter what length of fur she has at any given moment. When looking at collars, you will notice that there are not only different size lengths, but different widths as well. In general, thicker collars will provide more support, making them ideal for stronger dogs. Wider collars are also more comfortable because they will reduce the pressure on the neck. 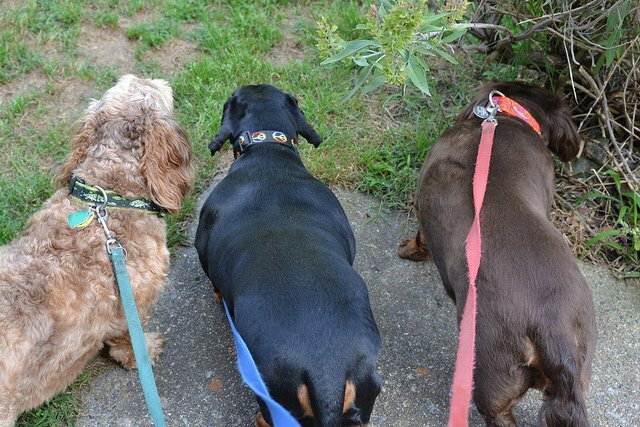 Keep in mind, however, that wider collars will weigh more, making them a poor decision for small breeds. If you are unsure about your dog’s strength, the best option is to go with a collar that is a standard 1 ½ inch width. If you are looking for a collar for a new puppy that is still growing, I would always opt for an adjustable one. Be sure the collar fits on the smaller end of the scale so there is more room for the puppy’s neck to grow. This will mean you don’t have to spend as much money on collars in the long run. After you measure your puppy and select what you think is the right collar, you aren’t done yet. Now you should try the collar on your pet. You want to make sure that it fits the dog comfortably and is not too loose or too tight. A general rule is that if it is a small breed you should be able to fit one finger under it; if it is a medium breed you should be able to fit 2; and if it is a large breed you should be able to fit 3. The most important thing is to make sure your dog is comfortable and if he is, you have selected the right size. If you’re still unsure which collar to buy, talk with your veterinarian about your dog and which collar would be best.